Repatriation is a harsh truth of the Mexican American existence within the history of the United States. This website focuses on the happenings of Repatriation nation wide and specifically in Michigan. The U.S. used the Mexican community as a convenient scapegoat from the economic devastation of the Depression. No other immigrant groups were being targeted for repatriation. By enacting laws depriving Mexicans of employment, mandating restrictive immigration policies and supporting deportation at the federal, state and local level, Americans became reassured in their endeavors of a more open job market. Due to these conditions in the U.S., Mexicans were convinced that their lives would be better if they returned to Mexico. Although they were “returning home” Mexicans from the U.S. would see just how disenfranchised they were from the changes that had happened in Mexico. The reason that this topic holds importance among the other aspects of Latino history is that it is something that the U.S. has chosen to forget. The vitality of this topic also poses the idea that something like this could happen again regarding the future of Mexican immigrants in the United States. It is the goal of Repatriation history to reveal the dynamic relationship of our past with modern day. 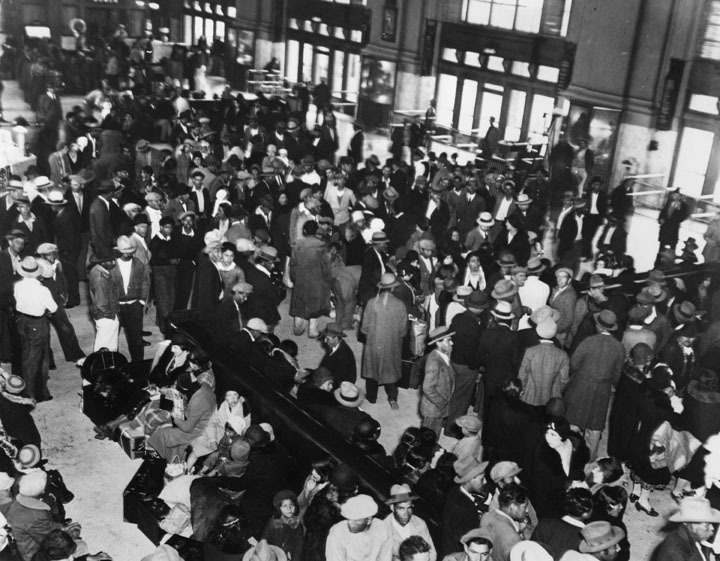 A crowd of Mexican American immigrants being sent back to Mexico in a formal repatriation (or deportation) in 1931-32. The location is Union Station. It has been estimated that approximately 400,000 were deported from the country, with about half leaving voluntarily and half forced. Fifty percent were U.S. citizens, largely the children of illegal immigrants who left with their parents. The return of foreigners to their country of origin by their own free will. The coerced expulsion of immigrants and U.S. Citizens of Mexican and Mexican-American descent from the United States during the 1930's.